TOP: Fat and Tasty BBQ cook Derrick Keeswood unwraps a rack of ribs as he prepares it for the smoker. 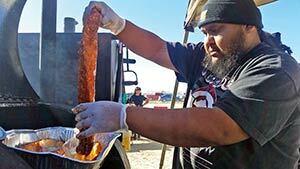 Keeswood and his brother JR entered the cook-off held during the Shiprock Fair to test their barbequing skills. They won three of the four categories. The Northern Navajo Fair is known for its ongoing traditions in events like the Yei Bi Chei and parade but there is hope for a new tradition with a tasty setting. 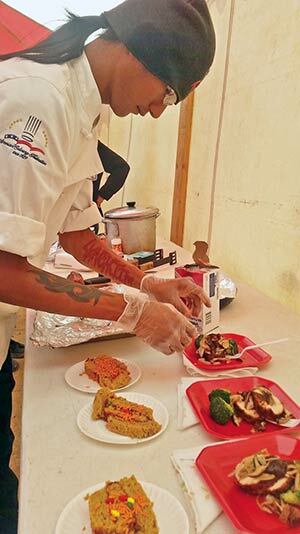 The first Northern Navajo Fair cook-off took place on Oct. 3 with a head-to-head competition between Hogback, N.M., natives JR and Derrick Keeswood and Shiprock’s Lynch Jim. These cooking pioneers faced off in four different categories: stew, roast mutton, barbecue and dessert. Coordinator Frank Smith said he wanted to host a cook-off just to add something new to the fair.